Success in school starts with reading. Learning to read is hard work for children. Fortunately, research is now available that suggests how to give each child a good start in reading. Preschool and kindergarten teachers set the stage for your child to learn to read with some critical early skills. First, second, and third grade teachers then take up the task of building the skills that children will use every day for the rest of their lives. As a parent, you can help by understanding what teachers are teaching and by asking questions about your child's progress and the classroom reading program. You can also help your children become readers. Learning to read takes practice, more practice than children get during the school day. This brochure describes what a quality reading program should look like at school and how you can support that program through activities with your children. Teaching the sounds of language. The teacher provides opportunities for children to practice with the sounds that make up words. Children learn to put sounds together to make words and to break words into their separate sounds. Teaching the letters of the alphabet. Teachers help children learn to recognize letter names and shapes. Helping children learn and use new words. Reading to children every day. Teachers read with expression and talk with children about what they are reading. Practicing the sounds of language. Read books with rhymes. Teach your child rhymes, short poems, and songs. Play simple word games: How many words can you make up that sound like the word "bat"? Helping your child take spoken words apart and put them together. Help your child separate the sounds in words, listen for beginning and ending sounds, and put separate sounds together. Practicing the alphabet by pointing out letters wherever you see them and by reading alphabet books. Systematically teaching phonics--how sounds and letters are related. Giving children the opportunity to practice the letter-sound relationships they are learning. Children have the chance to practice sounds and letters by reading easy books that use words with the letter-sound relationships they are learning. Helping children write the letter-sound relationships they know by using them in words, sentences, messages, and their own stories. Showing children ways to think about and understand what they are reading. The teacher asks children questions to show them how to think about the meaning of what they read. Pointing out the letter-sound relationships your child is learning on labels, boxes, newspapers, magazines and signs. Listening to your child read words and books from school. Be patient and listen as your child practices. Let your child know you are proud of his reading. Continuing to teach letter-sound relationships for children who need more practice. On average, children need about two years of instruction in letter-sound relationships to become good spellers as well as readers. Teaching the meaning of words, especially words that are important to understanding a book. Teaching ways to learn the meaning of new words. Teachers cannot possibly teach students the meaning of every new word they see or read. Children should be taught how to use dictionaries to learn word meanings, how to use known words and word parts to figure out other words, and how to get clues about a word from the rest of the sentence. Helping children understand what they are reading. Good readers think as they read and they know whether what they are reading is making sense. Teachers help children to check their understanding. When children are having difficulty, teachers show them ways to figure out the meaning of what they are reading. Rereading familiar books. Children need practice in reading comfortably and with expression using books they know. Building reading accuracy. As your child is reading aloud, point out words he missed and help him read words correctly. If you stop to focus on a word, have your child reread the whole sentence to be sure he understands the meaning. Building reading comprehension. Talk with your child about what she is reading. Ask about new words. Talk about what happened in a story. Ask about the characters, places, and events that took place. Ask what new information she has learned from the book. Encourage her to read on her own. Share conversations with your child over meal times and other times you are together. Children learn words more easily when they hear them spoken often. Introduce new and interesting words at every opportunity. Be your child's best advocate. Keep informed about your child's progress in reading and ask the teacher about ways you can help. This brochure was published by The Partnership for Reading, a collaborative effort of the National Institute for Literacy (NIFL), the National Institute of Child Health and Human Development (NICHD), and the U.S. Department of Education to make evidence-based reading research available to educators, parents, policy-makers, and others with an interest in helping all people learn to read well. RMC Research Corporation developed this brochure with funding from the National Institute for Literacy under contract number ED-00-CO-0093. The comments or conclusions do not necessarily represent the positions or policies of NIFL, NICHD, or the U.S. Department of Education and you should not assume endorsement by the Federal Government. The National Institute for Literacy, an independent federal organization, supports the development of high-quality state, regional, and national literacy services so that all Americans can develop the literacy skills they need to succeed at work, at home, and in the community. The National Institute for Literacy administers The Partnership for Reading and other programs that promote child and adult literacy. For more information about NIFL and reading, visit www.nifl.gov. 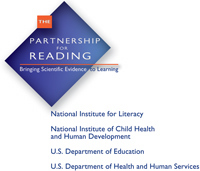 To obtain the full copy of Teaching Children to Read, the 2000 report of the National Reading Panel, which serves as the basis for the information in this brochure, visit www.nationalreadingpanel.org. For additional copies of this brochure, contact the National Institute for Literacy at ED Pubs, PO Box 1398, Jessup, MD 20794-1398. 1-800-228-8813. Fax 301-470-1244. Email edpuborders@edpubs.org. Or download the document at www.nifl.gov.